Thank you to our major donors and sponsors for your generous contributions to Shoulder to Shoulder and Hombro a Hombro’s success for the last 25 years. Chiquita has been a major sponsor for more than 22 years with support in logistics, shipping, and financial assistance. 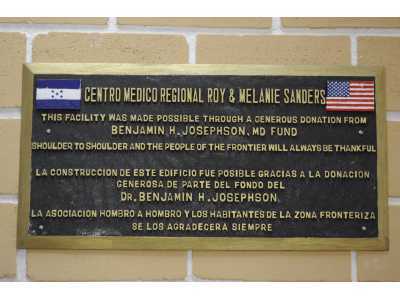 The Benjamin H. Josephson MD foundation has been a major contributor of medical education and expansion of the Shoulder to Shoulder model into new communities in Honduras. Dr. Roy and Melanie Sanders have provided the financial support to jumpstart the expansion of the service area of Shoulder to Shoulder in rural Honduras. SNC-Lavalin is a major donor of personnel, electrical and construction equipment and supplies. Freund, Freeze & Arnold has provided vital legal, payroll, and financial support since the beginning of Shoulder to Shoulder. Jordan S. Sparks, D.M.D at OpenDental donated their dental practice management software. In the first year alone were able to track 5000 dental procedures for the individuals and families we serve in rural Honduras. A-Dec Dental has been a long term supporter of our dental clinics. Their donations of equipment, supplies, and expertise has been invaluable in helping to provide dental care to the individuals and families we serve in rural Honduras. Several chapters of Rotary Club International have provided significant contributions to Shoulder to Shoulder, including funding our water project and providing travel grants for volunteers. iCRco donated a turnkey computed radiography system to be used in a remote clinic in rural Honduras. Thousands of Hondurans will now have access to proper medical diagnoses and treatments due to the joint efforts by iCRco, Shoulder to Shoulder organization, and many other vendors that made this project a reality. The CR system donated by iCRco was a critical part to the success of the clinic. Global Media, Inc is committed to providing technology that goes beyond the physical limitations of modern medicine through the design of tools which save time and money to improve the quality of care provided to patients worldwide. This company is donating a portable medical consul and the equipment and software to support the telemedicine system. This will be used for our clinic in Concepción. MinXray We have received an X-ray machine from MinXray, a world-wide leader in the portable x-ray industry. MinXray Inc. is a world-wide leader in the portable x-ray device industry and they have provided reliable, high quality equipment since 1967. Medweb specializes in distributed RIS/PACS and telemedicine with over 1,000 installations worldwide. The company recently introduced the VirtualPACS gateway module that electronically shares patient information between clinicians, radiology groups and imaging facilities for true enterprise PACS connectivity. The software-only DICOM archive and router is downloaded via a Web browser and auto configured to any Windows-based PC, so it does not require involvement of an IT specialist, making it the ideal teleradiology solution for Shoulder to Shoulder’s new Honduras clinic. Standard Textile has donated large amounts of linens for patients, dormitories, and clinic use. Bill Palmer and Hayes Handpiece Repair in Cincinnati is a welcome sponsor, supporting our dental and other projects. Matthew Sprouse, ASLA, CLARB and his firm Sitework Studios in Asheville, NC, has developed site plans for our new clinic in Concepción. Their work can be seen on our website. F & M Mafco has supplied welding equipment, generators and tools for our new clinic construction. Medical Products Laboratories has provided support for our dental program with significant donations of dental varnish to prevent decay in children. Benco has supported the Dental program with supplies and assistance. The Model Group has provided logistical support and warehouse facilities for shipping vital equipment and supplies to Honduras. The Henry Schein company has donated extensive dental supplies and equipment. Sunstar Butler has been a long standing supporter of the dental program with donations of dental supplies. Patterson Dental contributed some of the original support to the dental clinic and has continued to help ever since. The University of Cincinnati Department of Family Medicine is where Shoulder to Shoulder started. They have contributed with personnel, educational opportunities, office space, and in numerous other ways.